(updated September 6, 2012 @ 12:45pm) I don’t often get a Tuesday night off from work. When I do, for some reason, I like to beat myself over the head and check out the Tustin City Council meeting in person. Perhaps it is that sense of self-sacrifice, or that sense of duty to my fellow readers. Who are we kidding? I go because I am still trying to see if John Nielsen can speak without Jerry’s lips moving. Which brings us to the focus of the evening. After discussing the cost of police cars with Al Murray the expert and hearing how the Biennial Conflict of Interest Review followed the letter, if not the spirit of the law, we got to the main event, the Response to the Grand Jury Report on Use of Government Influence on Private Educational Institutions. At an earlier council meeting, this issue was glossed over by John Nielsen who was already gearing up to defend his puppetmaster’s free speech rights and the city attorney was asked to come back with a proposed response. The Tustin City Council members have carefully read and considered the Report and its findings and recommendations. Unfortunately the City Council is unable to provide an informed response to the findings and recommendations because the Council does not have evidence that would provide a basis for such findings or actions. The Report discusses the alleged activities of, and statements made by, individuals in their personal interactions with local university personnel. Some of those individuals are said by the Report to be affiliated with another agency or a non – profit organization, and none of the individuals involved in the alleged discussions was acting with the knowledge or authorization of the City Council or City staff. Put another way, because the Report is not about the City or its programs or activities, the City doesn’t have the evidence to support or refute the statements in the Report. When a grand jury report addresses the ” operations, accounts and records of the officers, department functions, and the method or system of performing the duties” of the City as authorized by California Penal Code Section 925a, then the City and its staff and City Council are generally in a position to provide an informed response. That is not the case here. ….The City Council does not take lightly the circumstances alleged in the Report. In that regard, the City Council acknowledges that, if it were aware of evidence of wrongdoing by a Tustin City Council member and if such conduct was of a nature that was within the authority of the Council to correct, then the City Council would recommend additional ethics training be undertaken over and above that required by State law, or might consider a censure, for instance. However, as noted above, the City Council is not privy to testimony or other evidence that a Tustin City Council member attempted to exert the influence that the Report alleges. In fact, many allegations in the Report seem to suggest that the alleged emails and verbal statements may have been made by an individual not even affiliated with the City of Tustin. So, the city attorney conveniently provided a detailed letter of response claiming the city had no responsibility to respond and, even if they did, it was a free speech and this council would never quash a person’s right to free speech, would they? The city attorney must have anticipated this would be the most likely response as he did not provide guidance for any of the other possible responses outlined in the report. Gee, why would that be? Could it be that the city attorney colluded with certain councilmen to come up with the “I’m appalled you would say that about me” response? conversation with another fellow citizen and a couple of teachers about how the school was “being used” by other nefarious individuals with “hidden political agendas” [insert laugh track]. He pulled out reams of paper (where’s that iPad, Jerry?) to support his position and, waving them around like a magic wand, claimed he was the victim. He bashed the grand jury, calling the report poorly written, full of innuendo and inference and lacking evidence and fact. he reiterated his position that he and his good friend Alan Songstad went there as private citizens to discuss the disparagement of the university and not to discuss any report on city manager compensation. Of course, it is intersting that, if Jerry had gone down there with just any close friend, he went with Songstad, a fellow councilmember from Laguna Hills rather than just any friend off the street. Oh, and it was a fact they had discussed this at a local association of local governments (funded by your tax dollar) meeting with others to discuss the report. In any case, this was the Amanteversion of how things went. And, as he said, “I was one of the four in the room” so how would the grand jury know what they talked about? Indeed. Isn’t that why grand jury testimony is secret? At the beginning of the 30 minute discussion on the issue, Councilwoman Deborah Gavello moved to have Jerry censured at the next council meeting. That motion was subsequently displaced by a substitute motion to have the letter, as written, sent to the presiding judge. When it did come to the vote, there was brief discussion on whether Amante should be allowed to vote on his own punishment. City Attorney David Kendig quickly chimed in that the FPPC had recently ruled that a councilman could vote on his own appointment to a board or committee. Apparently, in his legal mind, Amante’s seat on the local government association in which the report and their actions were discussed, transferred to the dais, here and now, and he should be allowed to vote on his punishment. And that is what happened. On a 3-2 vote on whether the letter should be sent in response or Hizzoner should be censured, the city council approved the letter as written. You didn’t really think it would turn out any other way with the Gang of Three, did you? So, what do Republican Jerry and Democrat Claudia Alvarez have in common? Well, not too long ago, in a nearby city, Santa Ana Councilwoman Claudia Alvarez did the same thing. Speaking at a city council meeting about the 4th Street downtown area owned by the Chase Brothers, she expounded on Irv Chase renting his property to just anyone. In her tirade, she asked, “If Hitler rents you a place and gives you a good deal, would you take it”? Of course, you don’t invoke the “good” name of Hitler when speaking to a Jewish businessman and the son of a Holocaust victim, and certainly not in a public forum. It raised a huge outcry among the folks in Santa Ana. And, while we may disagree on whether Amante was actually attemtping to use his influence as a councilman while Alvarez was clearly acting in her official capacity, the eventual outcome of these two situaitons was the same. 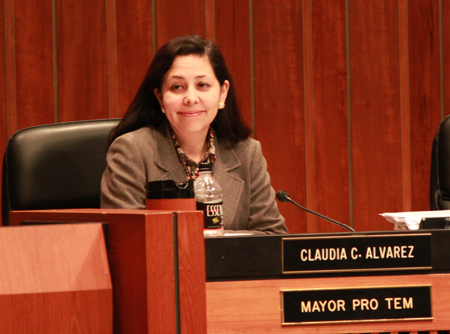 Like Amante, the Santa Ana City Council initially attempted to squelch the issue, claiming she had free speech rights. When that didn’t work, Alvarez attempted to justify her position, claiming the people had her all wrong and they obviously misinterpreted what she had said (does this sound familiar?). Eventually, her cohorts on the council were obligated to bring up the issue, and they did. And, like Amante, when it came time to vote on whether she should be punished and to what extent, she was allowed to vote on her own destiny. Now, we’ll hand it to Alvarez. She must have seen the light, finally, and cast the deciding vote to censure herself. But, in doing so, she saved her pro tem title and the censure itself did little else than say, “no-no”. So, you can see that Jerry and Claudia have a lot in common. Perhaps they should start the Amante-Alvarez Coalition on Ethical Behavior on the Dais. Gavello: Can I go first? Gavello: Point of order, Mr. Mayor. Nielsen: Can you let me finish? Gavello: I don’t have to. Nielsen: Quit talking over me. Gavello: I’m not talking over you, it’s a point of order… which means you are supposed to…. Nielsen: Councilmember Gavello, I will not let you bully me…. Say what? So, the King of Bullies’ black ops guy, John, won’t let Deborah bully him, yet he will readily allow Hizzoner Amante to bully and rant against Gavello. That’s the Republican idea of free speech for you in action. Alas, we don’t have the ability to put Silverlight videos on the blog (perhaps someone will YouTube this and I will update the post with the links) but, you can see this little tirade on the city website beginning at time mark 52:25. You can also then hear Jerry Amante tie the upcoming 911 commemoration in with rants full of innuendo toward Deborah and my blog at the end of the meeting beginning at time mark 1:31:55. That, in itself, was worth coming to the meeting. Posted on September 6, 2012, in Local Government, Politics, Tustin City Council and tagged conspiracy theories, cronyism, deborah gavello, hitler, ipad, Jerry Amante, john nielsen, Tustin City Council. Bookmark the permalink. 9 Comments. “It’s free speech!” Do these people not know that there are many things that are “speech” that are crimes? Some include filing a false police report, obstructing justice, fraud, insider trading, lying to a federal officer, perjury and releasing top secret security documents. This mayor would appear to excuse all of these since they involve “free speech” I suppose. By its very nature, exercising undue influence would seem to require “speech” in oral or written form. Another form of “free speech” is applause or clapping in council chambers, an act which the councilman in question forbade when he was mayor. Apparently his belief in “free speech” is not as absolute as it would seem, and applies only when it helps certain people. Only a two months more to endure his tirades. Our only hope is that we elect decent people who will not be clones of Amante!! It’s probably not too early to start calling for the city council to implement a sunshine law as well as tightening up the lobbying law to include registration. Gavello already mentioned it at the meeting. 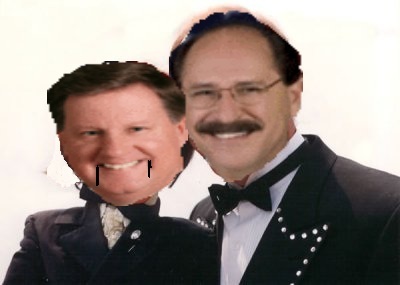 It’s time for a reader survey on the worst Mayor’s in Tustin’s history–For a long time I thought it was Prescott and Kelly- I saw them in action when I had to go for a THS govt. class but looking back it was just good entertainment and they really did no harm to anyone. Fast forward to 2012— without question the two worst ( in a 1st place tie!) are Amante and Nielsen, they put everyone else to shame. One just has to read your blog to know why Amante rates as the worst, Nielsen has proven himeself to be worthy of a tie with Amante and also one of the biggest buffons ever to sit in the mayor’s seat. I love his quote to Gavello… ” I will not let you bully me…” I understand his point after being bullied by his wife (or semi-ex wife) for 20+years—— anyone else with nominations? I watched the council meeting, and Gavello didn’t bully Nielson she asked for a Point of Order, in that Nielson spoke first on Grand Jury item, and point of order requires him to let everyone else on the dais speak first. Point of Order is suppose to stop all speaking, but Nielson doesn’t follow the rules! Gavello wanted to get Amante to recuse himself, and not be involved in the discussion on his own punishment. Where are we living that someone votes on their own punishment? Amante is a liar, he did read the report. Someone report him to the Bar Association please.